You are here: Home / Mindjammer / Mindjammer – Hearts and Minds out now! Mindjammer – Hearts and Minds out now! We’re delighted to announce that Hearts and Minds, the first scenario for Mindjammer – The Roleplaying Game, is out now! Order the adventure and download a complimentary PDF version today, with your print version shipping immediately. Hearts and Minds will also be available in hobby stores everywhere from May. “One hundred years ago no one had even heard of aliens. Then the sightings began — uncanny lights by the Snow-Layer, anomalies on our radar, strange reports from lone farmers or the pithecines in the backwoods. Some people thought it was the brave explorers of legend, returned from fabled Homeworld to help us in our hour of need; others thought it was the precursor to an invasion by an alien race, with designs on the fertile lands of our cratered home. “Twenty years ago they announced themselves — and it was both. The Homeworlders had come, in force, and were nothing like our myths foretold. Heedless of our ways, they swept in like a whirlwind, and it seemed there was nothing we could do to stop them. The world of Olkennedy is on the brink of civil war. Deadly factions with nefarious agendas conspire for power in a society reeling from culture shock, and your characters are the only thing holding back a bloody conflict which will tear the planet apart! guidelines for convention and one-shot play. Written by Mindjammer author-creator Sarah Newton, Hearts and Minds is an action-packed scenario for the award-winning Mindjammer — The Roleplaying Game, transhuman science-fiction roleplaying using the Fate Core rules, published by Mindjammer Press and distributed by Modiphius Entertainment (Achtung! Cthulhu, Mutant Chronicles, Thunderbirds). 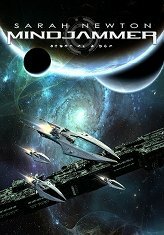 The Mindjammer — The Roleplaying Game core book is required for play. Grab your blaster, thoughtcast your commands to the starship sentience, and engage the planing engines – the transhuman adventure is just beginning!